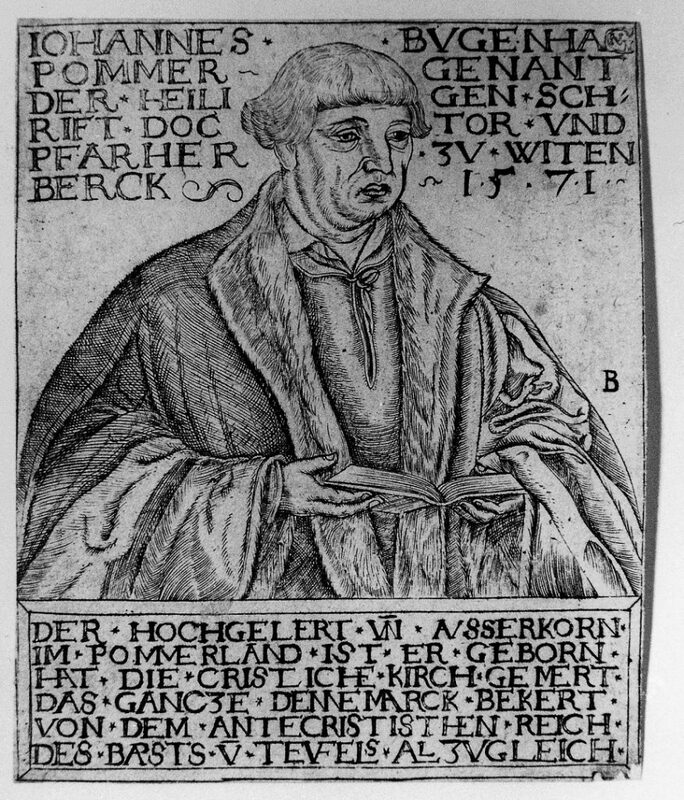 The Wittenberg reformer is shown in a head-and-shoulders portrait, looking to the right. He is depicted bareheaded, over his shirt and doublet he wears a fur-trimmed coat, in his hands he holds an open book, probably a bible. The type of the portrait goes back to the very popular inventions of the Cranach-workshop. Other than the biographical notes next to the portrait itself, the inscription on the balustrade pays tribute to Bugenhagen’s activities in the context of spreading the Reformation throughout Scandinavia. The idea of the old church as being a kingdom of antichrist and devil at the same time is mentioned here. This polemic identification refers to the writings of Luther, published from the 1520s onwards. The reformer interprets the situation of his time in an eschatological way, counting the appearance of the Antichrist among the signs that announce the end of the world. It could be concluded that only conversion to the Protestant church could save mankind from disaster.